If you like to smoke joints, you’ve probably had a joint canoe before. If not, you are either very lucky or have no idea what I’m talking about. If you like to smoke joints, you’ve probably had a joint canoe before. If not, you are either very lucky or have no idea what I’m talking about. Despite your particular circumstances, let’s solve this problem once and for all. What is a canoeing joint? Ever smoking a joint, and it starts to burn unevenly? Well, it kind of resembles a canoe. 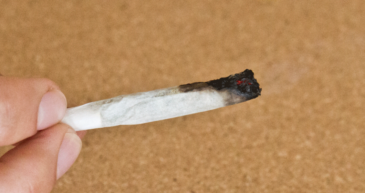 Nothing is worse than rolling a joint for you and your friends, and having it burn like the joint above… I mean, seriously, it does look like a canoe. All of these options are unfortunate. Who wants to worry about an uneven joint when you’re just trying to have a good time? Joints canoe for a few reasons. Unfortunately for you, they are all your fault. One of the biggest reasons that joints burn unevenly is because they are are not rolled tight enough. When there is space between the bud and paper, it makes for an uneven toke. Another common cause of canoeing joints is that you are not lighting your joint evenly. Spin the joint while you light it to ensure that all sides are catching fire. Sometimes, joints can canoe simply because of the wind. The best way to avoid this is to smoke in a more enclosed area – a gazebo, parked car, or in a garage are all fantastic options. Don’t be a dummy and try to enjoy all that a joint as to offer in a windstorm. Additionally, while some users love using joint rollers, many report that their joints canoe more often. Therefore, trust yourself. Grind the bud, and roll it tight in order to insure that your joints will not burn unevenly. If you try all of these tips and maintain the fact that you can roll an above average joint, there is only one solution. Start using a vape. Friends, you deserve to enjoy your joints in peace, and without the heartache of your joint canoeing. Learn to spot the warning signs, and know the quick-fixes if you are ever in a pinch. No matter what, happy smoking!